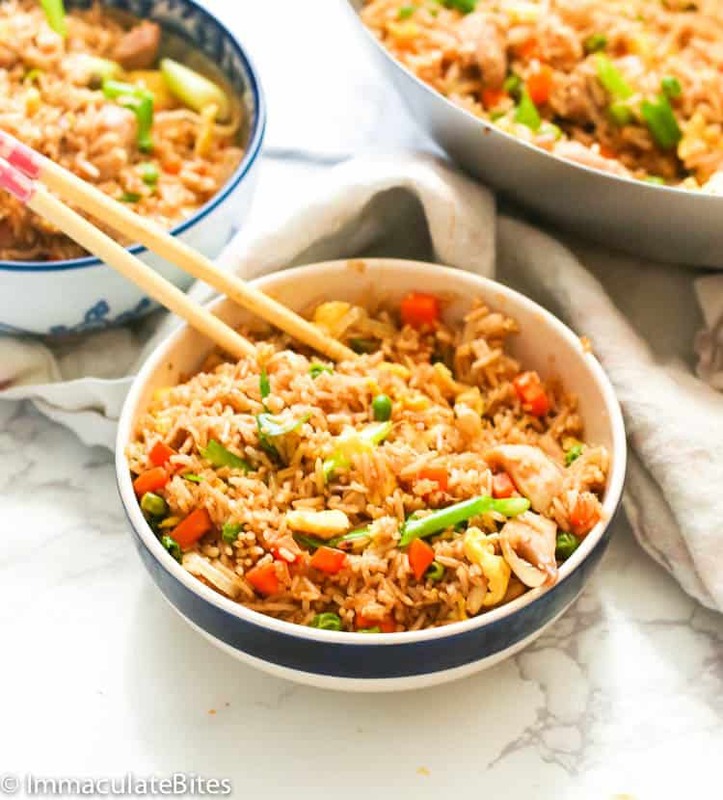 Chicken Fried Rice – quick and easy weeknight dinner or lunch made with soy sauce-kissed crisp-tender rice, chunks of marinaded chicken and crisp vegetables. Better than your favorite takeout fried rice! We have this favorite little Chinese restaurant here in L.A. that we always go to during birthdays and special occasions. And just out of the blue, I got the hankering for their classic hit chicken fried rice. So I made a big batch of my own version of chicken fried rice to curb the craving. 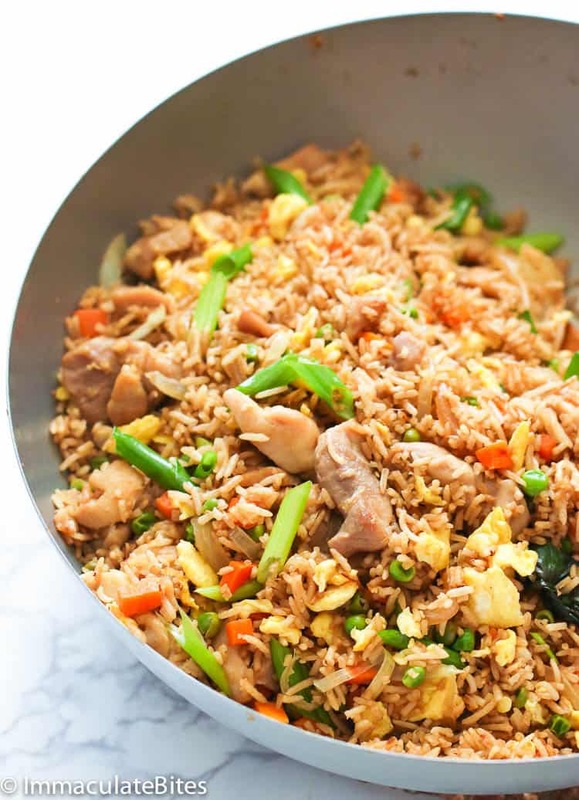 The secret to a perfect fried rice is to prepare everything first as frying rice goes by quickly using the most high heat cooking methods. And by that, it means you have to measure everything right before you start this recipe so that all you have to do is just throw everything in the pan. Moreover, perfecting a fried rice, means using a day old rice. No fresh rice please! Fresh-cooked rice tends to get clumpy and mushy when you fry it immediately. Instead, use leftover rice or cook the rice in the morning, store it in the fridge and fry it in the evening or the day after. No wok? Don’t worry! 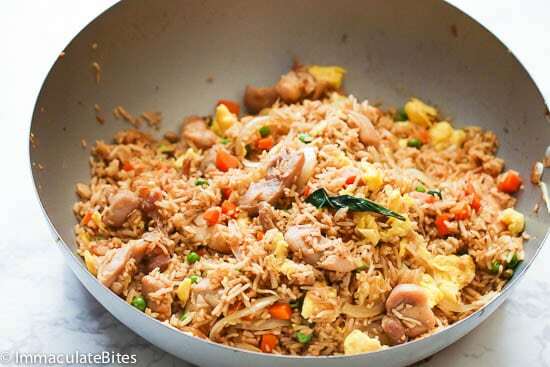 You can still have a tasty and decent chicken fried rice OR any fried rice using a heavy-bottomed skillet. What’s in chicken fried rice? I’ve tasted almost all types of fried rice. I can’t accurately determine which one’s my favorite ’cause I love every combination of fried rice like this Pineapple Fried Rice, Nigerian Fried Rice, OR this Coconut Fried Rice here. On the other hand, this variation of fried rice has mainly, of course, chicken as the star of the show. Here I use bigger chunks of chicken to elevate this dish as a main course. It’s called CHICKEN fried rice for a reason, right? 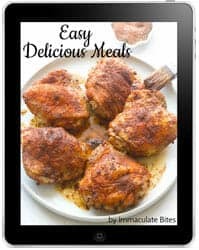 Along with the chunks of chicken, I also use easy to find recipes to make this dish super easy to prepare. I use peas and carrots, eggs, onions and green onions or scallions for garnishing. 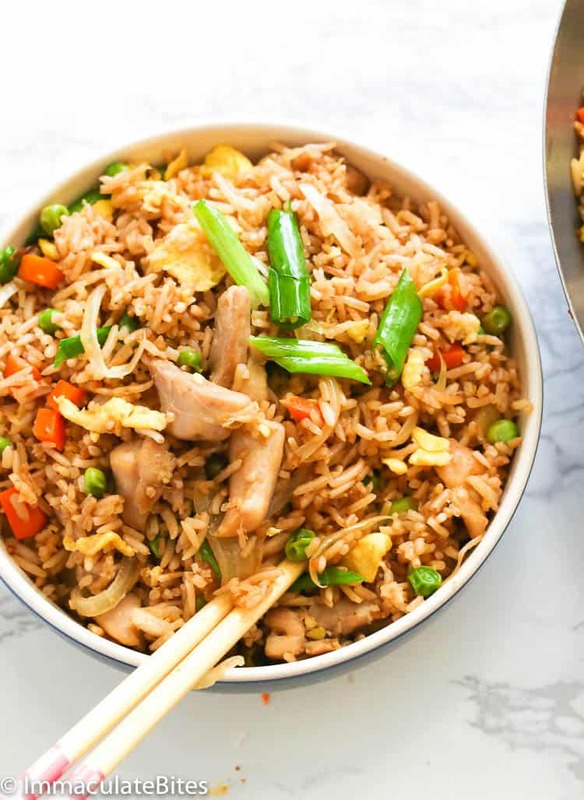 But in truth, you can jazz up this chicken fried rice the way you want it. You can add some broccoli, bacon bits, kale – your call! What kind of rice is used for chicken fried rice? Long grain cooked rice are much preferred when making any fried rice. This allows us to achieve a perfectly crisp-tender grain of rice that is packed with so much flavor. For a healthier version, you may replace it with a cooked brown rice. Again, so long as it’s a cold leftover rice, you’re on your way to greatness! Dinner shouldn’t be that complicated. And who doesn’t love a good fried rice meal? It’s quick, super easy and so versatile. 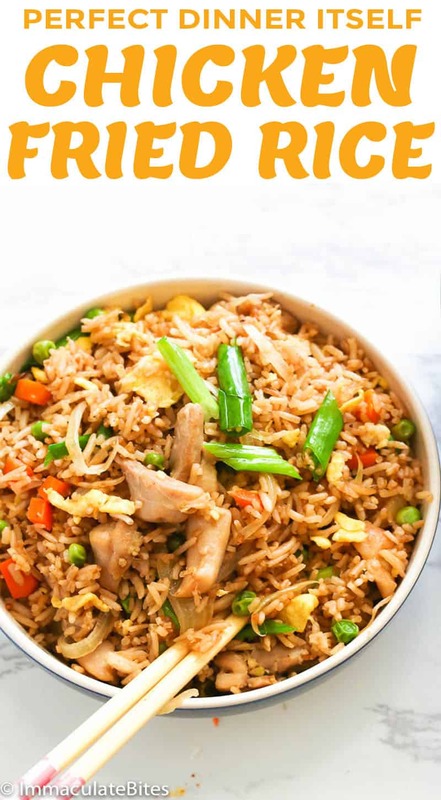 It will not take more than 30 minutes to serve this chicken fried rice up on your dining table. So go ahead and treat yourself! Oyster sauce adds flavor to a dish. It’s sweet and salty with a rich, earthy undertones. It’s great for stir frys and is available at major super markets, in the international aisle. Always use leftover rice or cook the rice in the morning, store it in the fridge and fry it in the evening or the day after. 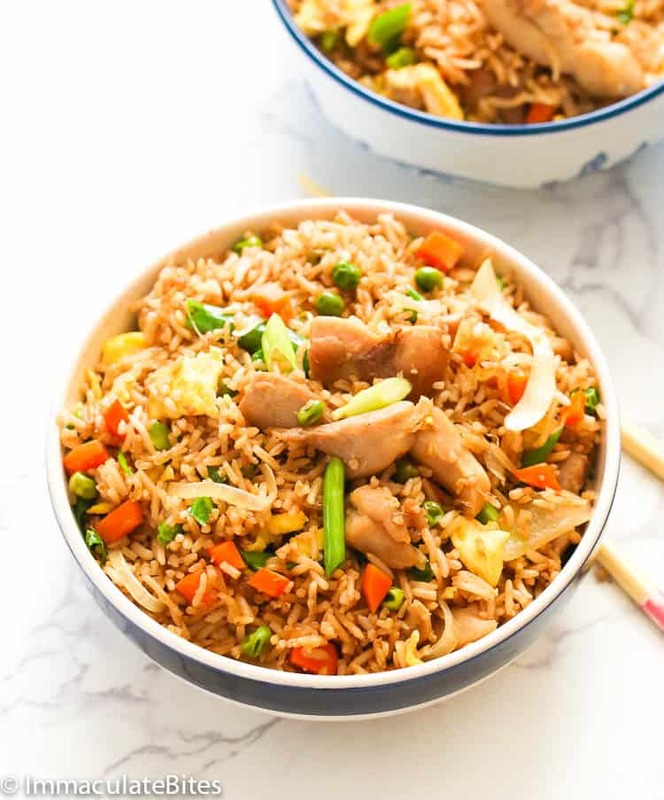 Also, if it’s your first time making a chicken fried rice dish, I suggest you follow this recipe first to a T and then customize it on your second try or onward. 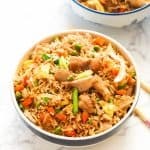 Chicken Fried Rice - quick and easy weeknight dinner or lunch made with soy sauce-kissed crisp-tender rice, chunks of marinated chicken and crisp vegetables. Better than your favorite takeout fried rice! Break up the clumpy rice before starting recipe. Then add the eggs and quickly stir to break the eggs apart. Remove eggs and transfer to a plate . Add about a tablespoon oil to the wok or pan . Once hot, add chopped chicken , Lightly season with salt and pepper . Saute for about 5 – 6 minutes, or until cooked through. Transfer chicken to a plate and set aside. Continue with the stir frying by adding a tablespoon of oil into the wok, followed by onions, garlic , ginger, peas, carrots and basil , if using any . Cook for about 2-3 minutes . Add the rice, stir vigorously for about 2-3 minutes adding soy sauce, oyster sauce , and about 1 tablespoon water to moistened rice. Finally return the combination of, eggs, and chicken to the wok. Stir until everything has been fully combined and chicken is is reheated through. Add pepper flakes or hot sauce – optional. Adjust seasoning salt, pepper and soy sauce ,if necessary. Break up the clumpy rice before starting recipe. Heat a large wok or skillet on medium high heat with about a tablespoon of canola or vegetable oil. Marinate chicken , if desired before proceeding . Then add the eggs and quickly stir to break the eggs apart. Remove eggs and transfer to a plate. Add about a tablespoon oil to the wok or pan . Once hot, add chopped chicken , Lightly season with salt and pepper . Saute for about 5 – 6 minutes, or until cooked through. Transfer chicken to a plate and set aside. Continue with the stir frying by adding a tablespoon of oil into the wok, followed by onions and garlic. Then add ginger, peas and carrots. And then basil , if using any. Cook for about 2-3 minutes . Add the rice, stir vigorously for about 2-3 minutes adding soy sauce, oyster sauce , and about 1 tablespoon water to moistened rice. Adjust seasoning salt, pepper and soy sauce ,if necessary. Garnish with chopped scallion and serve. Made this tonite…it was Wonderful!!! So easy and now we dont have to go to our favorite place for it……got my own take our recipe…Thank you! Yaaay! I’m so happy you love it, Terri. It’s indeed easy; perfect for busy weeknights. Here are a few that comes to mind -Green beans, snow peas, asparagus, bell pepper, broccoli, cabbage. I just made this dish last night and I gave some to my neighbour,she couldnt keep quiet about how delicious it tasted and was requesting for more.thanks for keeping the recipe simple and easy. This is the best chicken rice I’ve tasted. It was so easy to make. Thank you so much for sharing. Thank you so much for your feedback. I am So Thrilled! How do we save recipes? At this time we do not have a feature that saves recipe. Hopefully soon. You can always bookmark the page. I have a template in Word to which I copy the recipes I like, always giving full credit to the chef/author. I use oyster sauce to add flavor but will sometimes switch it up with chicken bouillon- if not available. Or leave it out completely. My bad, I wanted to keep things easier . You marinate the chicken by using soy sauce , garlic, ginger, oyster sauce , sliced onions and hot sauce.